A revolutionary breakthrough about the cosmos was announced Thursday in Washington. Some of the technology used to discover it was created in the Bay Area. Byer, Chair of Stanford’s Department of Applied Physics, has been involved with the Laser Interferometer Gravitational-Wave Observatory (LIGO) project since 1988. His research team, along with an international team of astrophysicists, confirmed the final part of Albert Einstein’s Theory of Relativity. LIGO scientists created ultra-sensitive instruments in order to hear the universe for the first time. Previously, they relied on their eyes. By creating observatories serving as giant microphones essentially, scientists detected a gravitational wave that came from two black holes merging as one, more than a billion years ago. “In one-tenth of a second, more energy is released from that one event than all of the stars in the universe put together,” Byer said. Astronomers recorded the sound in September and played the chirping sounds in Washington today. “Ladies and gentlemen, we have detected gravitational waves. We did it,” LIGO executive director and Cal Tech professor David Reitze said to applause. Louisiana State University physicist Gabriela Gonzales says the recordings are just the beginning. “Now that we know binary black holes are out there, we’ll begin listening to the universe,” Gonzalez said. Stanford scientists say this closes the door on Einstein’s work, but opens the window to more discoveries. “Like black holes falling into each other, stars blowing up – those are the kinds of things we’re going to see. Something about the Big Bang, which was the biggest boom of all,” Stanford post-doctoral scholar Brett Shapiro said. 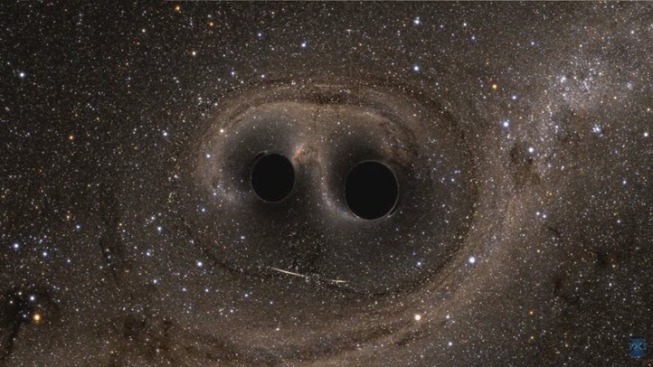 Scientists say we cannot feel gravitational waves, but the technology from the LIGO project reaches us in other ways such as improved laser technology to perfect jet airplane parts and improve medical surgeries, according to Byer. As for using the technology to discover extraterrestrial pieces of the cosmos, scientists say the devices only detect large events. “But planets and life out there is probably a different direction of research we’re not going towards,” Shapiro said.